It’s County Fair season, everybody! Of course, most people have had the pleasure of visiting the Ohio State Fair at least once in their lifetime. But have you had the joy of wandering around a good, old-fashioned County Fair? 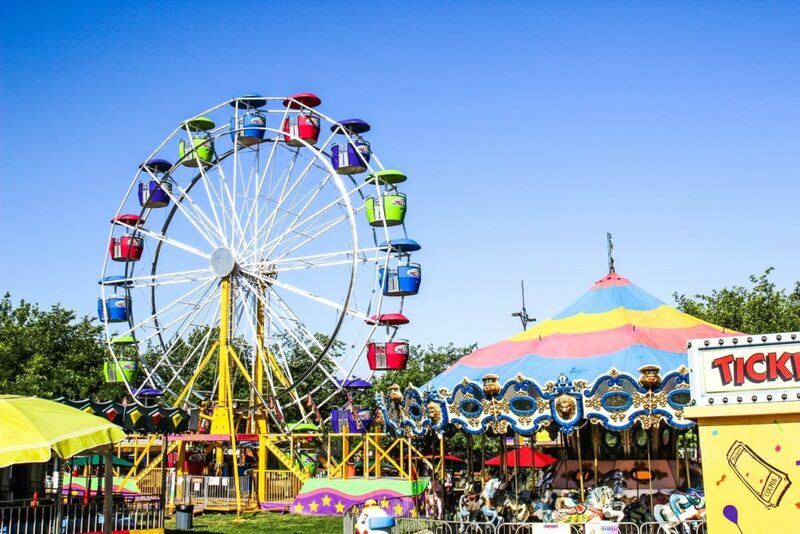 Heading out to the fairgrounds is a great way to hear live music, eat food, and people watch. If you’re anxious to fill your belly with carnival food ASAP, here are some county fairs near central Ohio that you won’t want to miss. Details: Daily admission at the gate goes for $8, and kids 10 and under get in free. Admission doesn’t include rides, so get a all-day ride pass for $14, or ride tickets for $1 each. Most rides cost three or four tickets each. Details: Adults get into the Madison County Fair for $7, kids ages 6-years-old to 12-years-old get in for $2, and kids 5-years-old and younger are free. Details: Ages 6 and up are $5 Monday-Thursday. Friday and Saturday it’s $7 to get in. Children 5 and under are free no matter what day of the week. Get an all-day ride pass for $12 or $1 per ride ticket. Details: Daily admission to the Franklin County Fair is $7. Children 2 and under are free. Individual tickets for rides are $1, or you can purchase a wristband for $10-$15, depending on the date. Details: General admission, which includes rides and grandstand attractions, is $10. Kids 2-years-old and under get in free, unless they want to go on the rides. Those brave toddlers get in for $7. Details: Daily tickets cost $10, and kids under 4-years-old are free. But in order to ride the rides you’ve got to have a ride pass which costs $7. Details: Kids under 5 are free, general admission goes for $6. Ride wristbands are available for $16. Details: Last year, general admission tickets were $7 and kids 8 and under were free. More infor about this year’s fair has yet to be released, but you can stay up-to-date by following them on Facebook. Details: Admission is $6 per person, unless you’re 5-years-old and under or 80-years-old and over. In that case, you get in free of charge. Rides are available for an additional cost. Details: Daily admission for guests 10-years-old and up costs $6. Wristband pricing for rides will be released shortly before the fair. Details: Prices for the Champaign County Fair are TBA. Details: The general admission prices for 2018 have yet to be announced. But the 2017 general admission went for $7 and kids 7 and under were free. Details: $5 a ticket for those ages 7 and up. Ages 6 and under are free. Ride the rides for free on Monday, August 7 from 12-5 p.m. if you’re 17-years-old and under. Details: General admission is just $5, but litte ones 10 and under are free. Wristbands for unlimited rides are $15. Details: Daily gate admission for 6-year-olds and up is $6. Ride wristbands are $10 a day. Details: Tickets are $8 per per person 9-years-old and up. Free admission for people under the age of 8, with special discount days for Veterans and Seniors. Details: Admission is $7. More info on the fair will be announced closer to Labor Day. Details: Admission varies depending on age and day of the week. Ride wristbands go for $15. Details: Anyone 10-years-old and over gets in for $5. 9-years-old and under get in free of charge. Get 12 ride tickets for $10. Kiddie rides will require three tickets and adult ride will require four. Now who’s ready for some funnel cake?